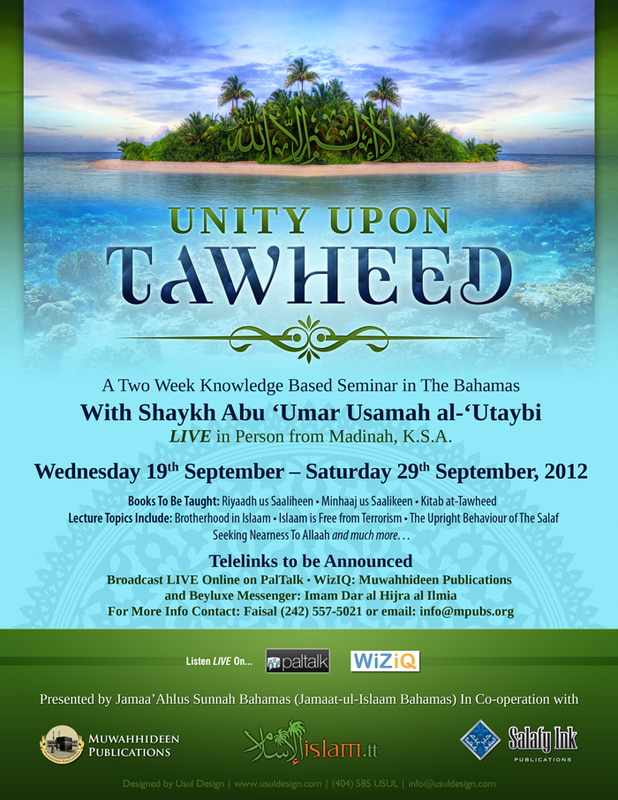 May Allaah reward the Salafees in the Bahamas and elsewhere for their efforts during this two-week, knowledge-based seminar with Shaykh 'Utaybi (hafidhahullaah) "Unity Upon Tawheed." The Imaam of Masjid Ibn 'Abbaas, Tobago, 'Ali al-Filistinee (hafidhahullaah) was the translator for the Shaykh throughout his visit to the Bahamas. Click on the Listen/Download links for these extremely beneficial audios. Class # 01 - 19/09/2012 - Chapter of Ikhlaas: Acions are by Intentions - Listen/Download 35:48 mins. Class # 02 - 20/09/2012 - Chapter of Ikhlaas: The Mahdi and Eesa - Listen/Download 66:55 mins. Class # 03 - 22/09/2012 - Chapter of Ikhlaas: Hijrah and Jihad - Listen/Download 89:38 mins. Class # 04 - 23/09/2012 - Chapter of Ikhlaas: For You Is What You Intended - Listen/Download 90:08 mins. Class # 05 - 24/09/2012 - Chapter of Ikhlaas: Deeds Done for The Sake of Allaah - Listen/Download 80:15 mins. Class # 06 - 25/09/2012 - Chapter of Ikhlaas: Intending A Deed and Doing It or Not - Listen/Download 45:59 mins. Class # 07 - 26/09/2012 - Chapter of Ikhlaas: The Three Men in The Cave - Listen/Download 39:00 mins. Class # 08 - 27/09/2012 - Chapter of Tawbah: Conditions of Tawbah - Listen/Download 49:18 mins. Class # 09 - 29/09/2012 - Chapter of Tawbah: The Man Who Killed 99 Men - Listen/Download 84:30 mins. Class # 10 - 30/09/2012 - Chapter of Tawbah: The Sincerity and Tawbah of Ka'b ibn Maalik - Listen/Download 93:10 mins. Class # 11 - 01/10/2012 - Hajj, Hijrah and Islaam Erases Everything Before It - Listen/Download 39:00 mins. Class # 01 - 19/09/2012 - Chapter of Taharah - The Conditions of Taharah - Listen/Download 73:22 mins. Class # 02 - 20/09/2012 - Chapter of Taharah - Purification of Clothes, Body and The Place of Prayer - Listen/Download 72:26 mins. Class # 03 - 24/09/2012 - Chapter of Taharah - Clean and Unclean Animals - Listen/Download 48:14 mins. Class # 04 - 25/09/2012 - Chapter of Taharah - Bodily Fluids and The Conditions of Wudhu - Listen/Download 72:10 mins. Class # 05 - 26/09/2012 - Chapter of Taharah - Conditons of Wudhu Continued - Listen/Download 56:45 mins. Class # 06 - 27/09/2012 - Chapter of Taharah- Wiping Over The Socks and Cast - Listen/Download 30:02 mins. Class # 01 - 19/09/2012 - Introduction to The Book & Biography of Imaam Muhammad ibn 'AbdulWahhab - Listen/Download 59:02 mins. Class # 02 - 20/09/2012 - The Rights of Allaah & The Ayah of The 10 Rights - Listen/Download 94:48 mins. Class # 03 - 22/09/2012 - The Ayah of Covering Eeman with Dhulm - Listen/Download 92:53 mins. Class # 04 - 23/09/2012 - The Virtues of Tawheed & The Sins It Forgives - Listen/Download 58:41 mins. Class # 05 - 24/09/2012 - The 70,000 That Will Enter Jannah Without Reckoning - Listen/Download 77:29 mins. Class # 06 - 25/09/2012 - Entering Jannah Without Reckoning - Listen/Download 81:44 mins. Class # 07 - 26/06/2012 - Calling to The Kalimat at-Tawheed - Listen/Download 98:49 mins. 21/09/2012 - Who is The True Muslim - Listen/Download 31:29 mins. 28/09/2012 - Stick to The Qur'aan and Sunnah - Listen/Download 22:19 mins. 21/09/2012 - The Rights of Women in Islaam - Listen/Download 74:58 mins. 28/09/2012 - Raising Children in Islaam - Part 01 - Listen/Download 23:48 mins. 28/09/2012 - Raising Children in Islaam - Part 02 - Listen/Download 21:16 mins. 18/09/2012 - Refraining From The Disobedience of Allaah - Listen/Download 67:11 mins. 20/09/2012 - Brotherhood in Islaam - Listen/Download 66:43 mins. 22/09/2012 - The Akhlaq (Good Character) of The Salaf - Listen/Download 67:10 mins. 23/09/2012 - Tawassul (Seeking Nearness to Allaah) - Listen/Download 128:21 mins. 29/09/2012 - Islaam is Free from Terrorism - Listen/Download 33:19 mins. Questions & Answers Session After Khutbah on 21st September, 2012 - Listen/Download 50:13 mins. Questions & Answers Session on 27th September, 2012 - Listen/Download 97:26 mins. Questions & Answers Session After Khutbah on 28th September, 2012 - Listen/Download 119:16 mins.